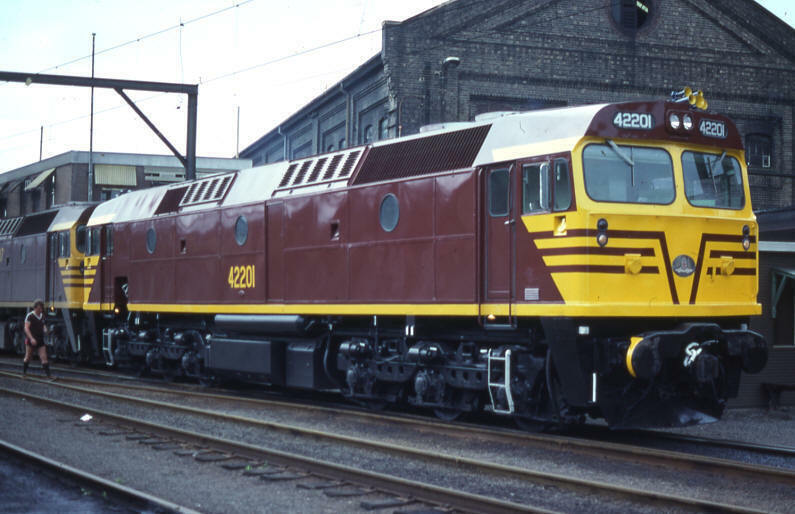 The NSW Government Railways (NSWGR) accepted delivery of its first 422 Class locomotive, 42201, in January 1969. 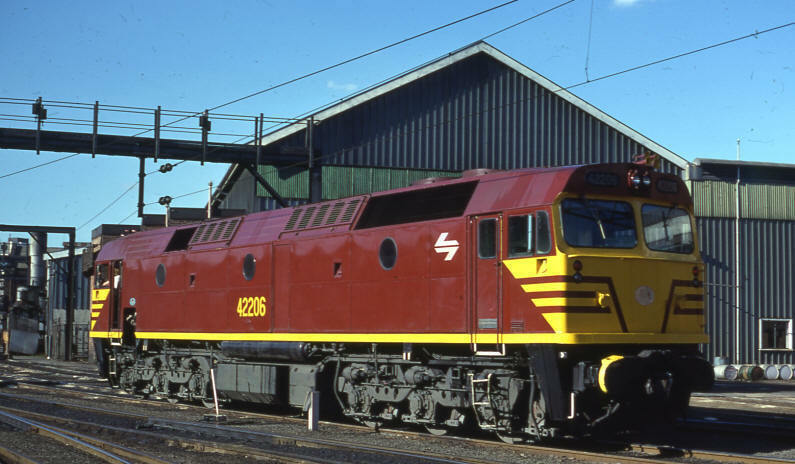 The delivery of 42201 marked the commencement of a new era of locomotive design in Australia with the first use of a double-ended box cab full-carbody arrangement. In all 20 such locomotives were built by Clyde Engineering at Granville for the NSWGR, with the final class member, 42220, entering service in January 1970. Clyde designated the 422 Class a Model J26C. The class was fitted with an EMD 16-645E roots-blown engine, which was also the first use of this equipment in Australia. 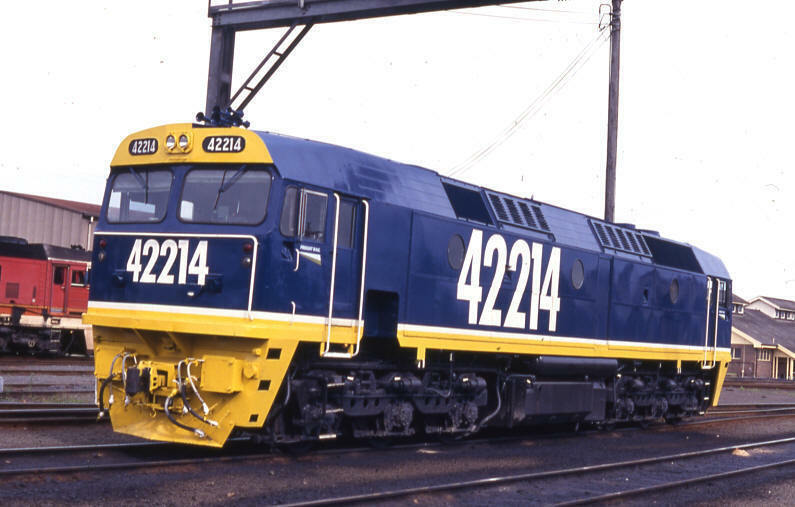 From their introduction until 1996, it was very rare for a 422 Class locomotive to work anywhere else apart from the Southern and Illawarra regions of NSW. The only real exception was the Albury to Melbourne line in Victoria, with through-working of the 422 Class becoming commonplace from 1982 onwards. In late 1980, 42220 re-entered traffic following rebuilding at the Clyde Engineering Rosewater SA plant. This locomotive was fitted with many upgraded features, including Super-Series and an EMD AR16 alternator en lieu of the D32B generator fitted to the rest of the class. Whilst retaining its general shape, many body modifications were carried out. Clyde designated 42220 a model J26C-2SS. 42220 was the only 2000HP locomotive in the world to be fitted with Super-Series. For 18 months from 1996 into 1997, the 20 class members were allocated to National Rail, and became a common sight on the Melbourne to Brisbane corridor. By early 1999, only 42206, 42209, 42210 and 42219 were in regular service with FreightCorp, 42203 and 42220 were with CountryLink, and the remainder of the class was in storage. 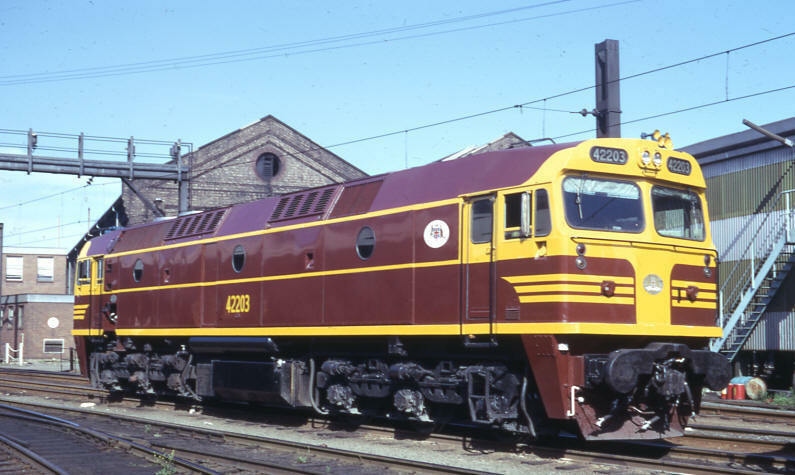 Whilst the 422 Class was in service with the NSWGR and its successors (NSW State Rail Authority, Freight Rail and FreightCorp), class members received only a number of modifications. In the early 1970’s, spark arrestors were fitted to the exhaust system, which resulted in the twin exhaust stacks being repositioned closer together. In the mid 1980’s, buffing plates were progressively removed from the entire class. In the 1990’s, the staff exchangers were removed from a number of class members, and in some instances the staff exchanger recesses were plated over. In 1999, 42203 and 42220 were fitted with air conditioners, which resulted in a large meshed door being fitted to diagonally opposite corners of the body sides. 42201, 42202 and 42203 were built without pressings in the mansard roof sections. All other class members entered service with the mansard roof areas having 3 parallel pressings. In 1999, 42202 and 42206 were sold to the Northern Rivers Railroad, based at Casino. In May 2000, 42201, 42204, 42205, 42207, 42208, 42209, 42210, 42211, 42212, 42213, 42214, 42215, 42216, 42217, 42218 and 42219 (16 units) were sold by FreightCorp to Australia Southern Railroad (ASR – later to become the Australian Railroad Group – ARG). In early 2001, 42203 and 42220, which had been loaned from FreightCorp to CountryLink for use on the Griffith and Broken Hill locomotive-hauled passenger services, were sold to Chicago Freight Car Leasing Australia (CFCLA). 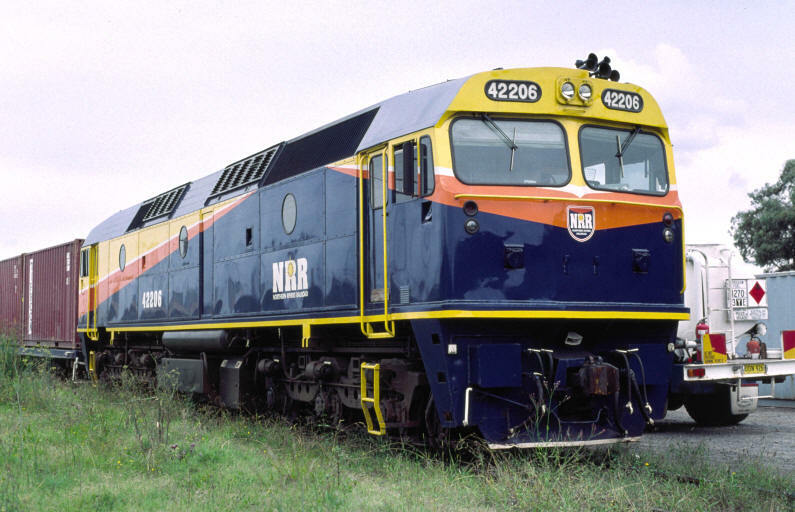 42206 re-entered traffic in June 2000 in an attractive blue, yellow, orange and white livery following refurbishment by Northern Rivers Railroad (NRR) at their Casino facility. In May 2002, NRR was sold to Queensland Rail, and the company was re-launched under the trading name of ‘Interail’. 42202 re-entered traffic 2 months after this sale, completely refurbished, in the same livery as 42206 but sporting ‘Interail’ logos. While the bodywork on 42206 was basically unaltered from FreightCorp service, 42202 was fitted with a new style of side windows, ditch lights, and new impact-resistant front windscreens. 42202 has been named ‘CASINO’. Just over half of the sixteen 422 Class units purchased by Australia Southern Railroad were in poor condition mechanically and electrically. 42207, 42209, 42210, 42211, 42218 and 42219 were returned to service fairly quickly, still in their FreightCorp blue liveries, but with ASR logos fitted to the cab sides. 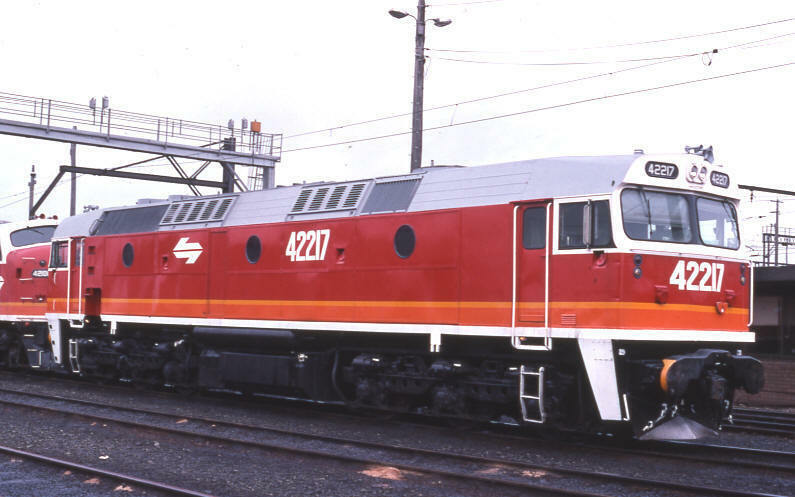 42219 was used in South Australia and Western Australia, while the other 5 locomotives returned to NSW in 2001. 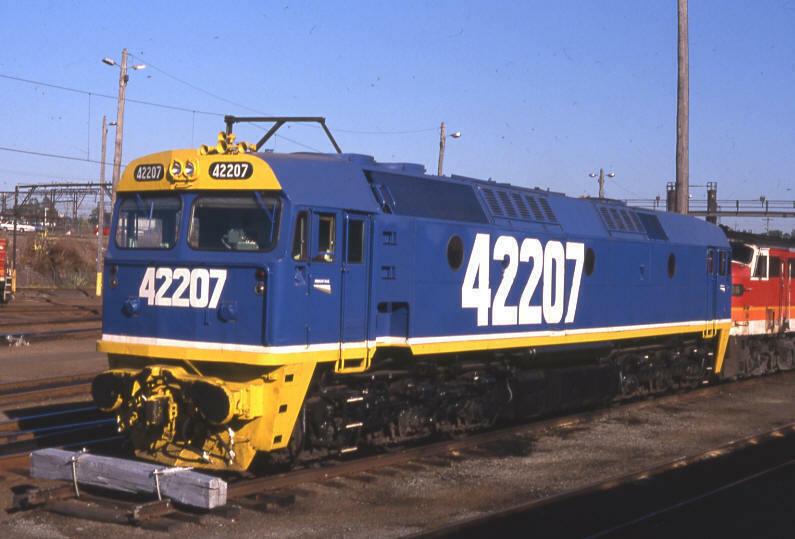 42207, 42209 & 42210 were hired to Lachlan Valley Rail Freight (LVRF), and 42211 & 42218 were hired to ATN Access. 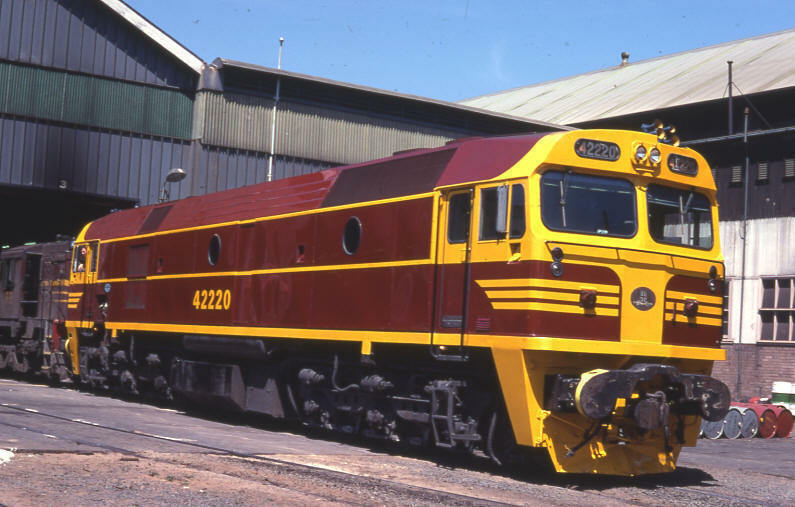 Soon after purchase, ASR decided to fully overhaul four of their stored 422 Class members in preparation for construction of the Alice Springs to Darwin railway line, and these were to emerge as the 22 Class, numbered 2201 to 2204. Apart from a full overhaul of all electrical and mechanical components, the cabs were upgraded, ditch lights were fitted, new impact-resistant windscreens and electric wipers were installed, together with air conditioning units identical to those fitted by FreightCorp to 42203 and 42220. Following the purchase of Westrail by ASR’s parent companies, ASR became a business unit of the Australian Railroad Group (ARG). 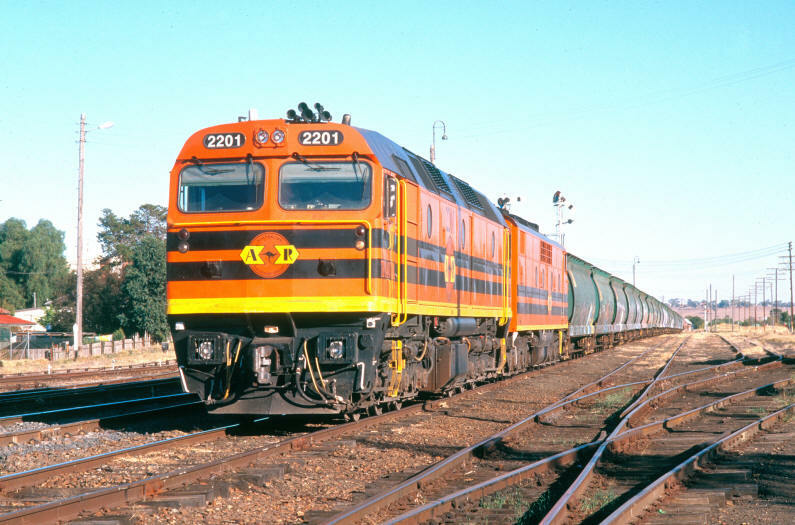 In mid 2001, 2201 to 2204 emerged from overhaul painted in the orange, black and yellow livery, and were fitted with Australian Northern Railroad (ANR) logos, representing the ARG business group responsible for provision of infrastructure train services on construction of the Alice Springs to Darwin railway line. 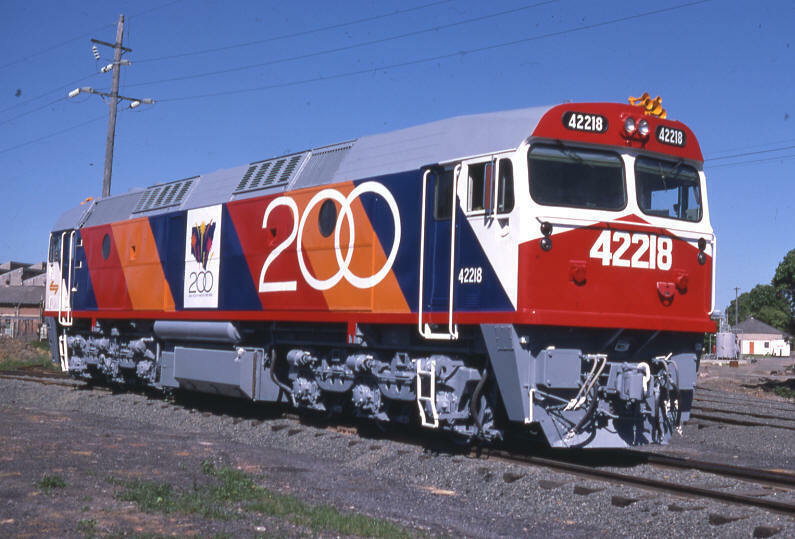 Following completion of the construction of the Alice Springs to Darwin railway line, 2201 to 2204 were fitted with ARG logos, and transferred to NSW to work the then newly-won Manildra contract for ARG. 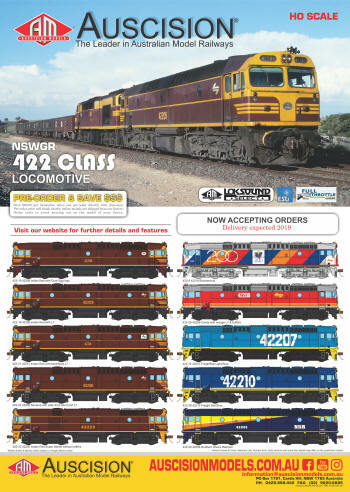 Members of this initial group of four 22 Class locomotives have also seen service in Western Australia. In time, ARG decided to fully overhaul the remaining 12 x 422 Class units in their ownership, to also emerge as the 22 Class. Nine of these units have entered traffic, and the remaining three as at February 2006 are undergoing overhaul at EDI Port Augusta. This batch of 22 Class locos differs externally from 2201 to 2204, in that they are not fitted with the large body side meshed doors to gain access to the air conditioning units. After purchasing 42203 and 42220, Chicago Freight Car Leasing Australia (CFCLA) set about refurbishing these two locomotives, and they re-entered service as HL203 and FL220 respectively. 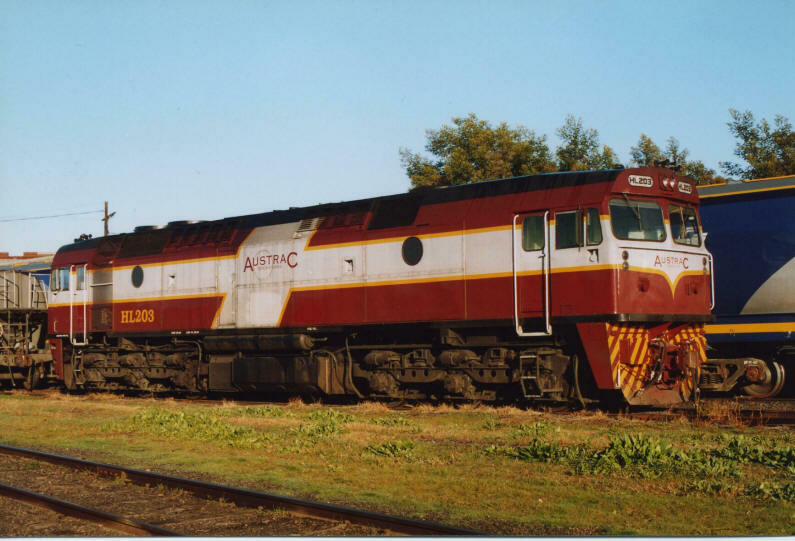 HL203 initially saw service on hire to Austrac Operations, but since the demise of this entity, the locomotive has been used by Patrick Portlink South Australia on their Balco services, Southern Shorthaul Railroad, ATN Access, Lachlan Valley Rail Freight and Patrick PortLink NSW. FL220 also saw initial service on hire to Austrac Operations, and has since been used by Interail, Patrick PortLink NSW, Lachlan Valley Rail Freight, Freight Australia, Southern Shorthaul Railroad and ATN Access. Indian red and yellow - 42201 to 42220. Reverse – 42201, 42202, 42203, 42204, 42205, 42206, 42207, 42212 & 42217. Candy – 42202, 42203, 42204, 42205, 42206, 42208, 42209, 42210, 42211, 42212, 42213, 42214, 42215, 42216, 42217, 42218 & 42219. Candy with FreightCorp logos – 42203. FreightRail light blue – 42207. FreightRail dark blue – 42201, 42205, 42206, 42209, 42210, 42211, 42212, 42214, 42215, 42217, 42218, 42219. FreightRail dark blue with FreightCorp logos – 42205, 42206, 42209, 42210, 42218, 42219. FreightRail light blue with FreightCorp logos – 42207. FreightRail light blue with ASR logos – 42207. FreightRail dark blue with ASR logos – 42209, 42210, 42211, 42218, 42219. 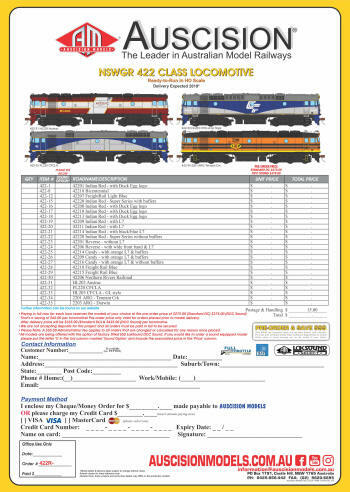 NRR blue, yellow, orange and white with NRR logos – 42206. 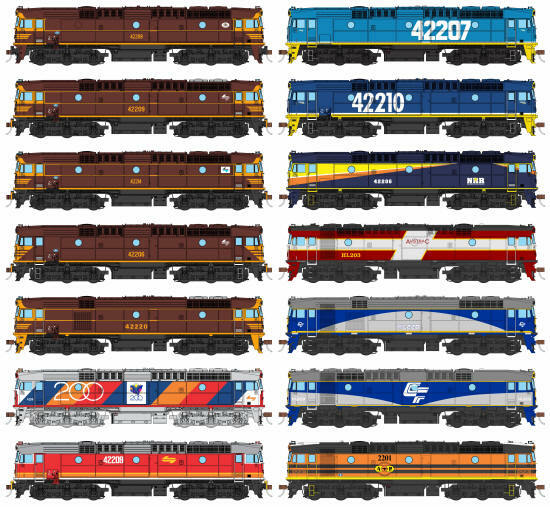 NRR blue, yellow, orange and white with Interail logos – 42202 & 42206. Dark blue ARG repaint with ARG logos – 42207. CFCLA blue, silver and yellow – FL220 (in 2003, this locomotive had extra yellow placed on the areas where the buffing plates were once fitted, and on the front sill just above the cowcatcher). Austrac Maroon and Grey – HL203 (in late 2002, following the cessation of Austrac Operations, this livery was modified by painting the grey areas maroon). Orange, black and yellow with ANR logos – 2201, 2202, 2203 & 2204. Orange, black and yellow with ARG logos – 2201, 2202, 2203, 2204, 2205, 2206, 2207, 2208, 2209, 2210, 2211, 2212, 2213, 2214, 2215 & 2216 (as at February 2006, 42209, 42211 and 42219 were undergoing overhaul, and will emerge in this livery as 2209, 2211 and 2216 respectively). reproduce models as accurately as possible and will always refer to the prototype for model accuracy.